I remember when corduroy was in And then it was out And then it was back in again. Well now I feel its ok to admit, I never stopped loving it (I know, how convenient right?) Now is a good time to love cords. While it’s still difficult to find tall clothes, I’d say behind tall jeans, tall cords are becoming increasingly easy to find in a plethora of price ranges and fits. Not only are tall cords easier to find now, but also easier to wear when remembering a few tips. First, think of tall cords as an alternative to jeans. Sometimes we put ourselves into a box when we think dress pants or jeans are our only options. In the fall and winter, tall cords are an option as well. In addition to being an alternative to jeans, you can compare the fit and style to jeans also. Tall cords typically come in boot cut, and lately can be found in flared, skinny, and wide leg silhouettes as well. You can find a low rise or a mid rise. (I’m sure if you look hard enough you can find a high rise but that is a bit too 80s for me…at least right now; can’t say I won’t succumb to the fashion pressure at some point). Secondly, as a tall woman, you can get away with almost any fit but keep in mind the look you are going for and your figure flaws and strengths. If you are especially curvy, you may want a mid rise with a straight leg. If you are tall and thin, flared or skinny work well. If you are plus sized,a mid rise with a wide leg, straight leg, or boot cut will work. These are just suggestions. If you’ve read my other articles you know I am mostly anti hard and fast rules in fashion. I think too often we limit ourselves and our personal style based on some arbitrary rule someone told us once. So use your judgment and try on different shapes and styles to see what works best. Lastly, in terms of what to pair with tall cords, again think of denim as an example of what to pair with tall cords, again think of denim as an example. You can wear them with sweaters, a snug fitting turtleneck, a blazer or cardigan, or a plaid button down. Opportunities to dress them up or down, abound.There are also different fabrics you can choose from such as fine whaled corduroys (on the dressier side) or wider whaled that lend themselves to a more casual look. If you’re going for a preppy look, which tall cords often lend them to; pair it with an argyle sweater. Or if you like the punk look, thanks to tall skinny cords that can be achieved also. The one thing I’d caution you on is that cords can look very…outfit-y (I think my husband made up that word, but I love the impression it gives). What I mean is, if you wear them with tortoise shell glasses and a turtleneck and oxfords they give off a very specific almost constum-ish look. If you’re ok with that and can pull it off (i.e. you look like you did it on purpose or you look like a supermodel) go for it. happen to read that sentence and think that outfit sounds rather cute. However, if you will look back on the ensemble later and think “What was I thinking?”—moments I have totally had– then spare yourself what I call outfit remorse. 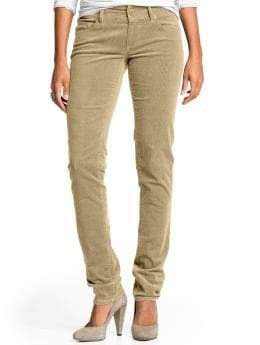 Visit Tall Clothing Mall’s section of women’s tall cords.